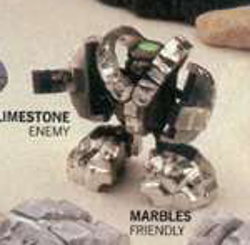 Slimestone is silver,which isn't slimy and not really a stone, continuing in the proud naming traditions of Rock Lords. Like Nuggit, Slimestone is chromed although he's silver rather than gold. He may not have quite the allure that Nuggit does, but he's highly desired by collectors all the same. As a villain, Slimestone is more obviously monsterous than Nuggit. Nuggit is small and cute, whereas Slimestone is small and bitey. His head design provides the only splash of colour on him, with a big jagged red mouth and green bug-eyes. And of course, the gigantic screw on the top of his head! He's very reminiscent of the Cadbury's Smash robots (remember them?) with his disc-like head, flappy mouth and round eyes. Despite his similarities to Nuggit, a lot of effort has gone into making him different. Slimestone's arms are comprised of chunks of his rock mode, with thinner stripes for the forearms giving a nice chunky effect. The most striking part of his design are the hollow loops around his shoulders which both look great and are unique amongst Rock Lord designs. All the bulk is pushed out to the limbs, and the revelation of a smooth inner body is also a nice idea, and complements his head. Slimestone is quite chunky and so doesn't have a great range of motion in his arms, as they get in the way of themselves. His feet can move from side to side and his head can swivel, but realistically the only real motion is in the arms. He can still do more than most other figures of the 80s, and is a very solid construction. Slimestone's weapon is... a sort of key. It's called (wait for it) a 'Slimegun'. Yeah. The handle looks to be bent, but is genuinely supposed to be this shape. It clips into his hand so he can wave it about menacingly. The Slimestone prototype had a dramatically different head, and it's something more similar to this head which appears in most of the Western Rock Lords media indicating that the change was late in the day. There's a also a big green dot covering the screw! Personally I think the new head is a lot more interesting, and gives the character a ton more personality! The transformation is basic but satisyfing. The loops close up over his head, and the arms and legs arrange themselves around the body to form the bulk of the rock mode. A clever touch is that the forearms close around the outside with the hands locking in place by holding tight onto his legs! Slimestone's rock mode is hard to fault. Like Nuggit it works from every angle, and while the joins are obvious (inevitable with a chromed figure) it doesn't really detract from the overall effect of being one solid rock. Just like Nuggit, Slimestone's strength is also his weakness. His chrome seems very prone to damage, and it's very hard to get hold of a pristine one. The plastic colour under the chrome is white, making indentifying the quality of Slimestones on ebay by photograph alone extremely tricky! Slimestone is another fantastic figure, as long as you can get hold of a good condition one! There's a clear design ethos throughout the mold, making him out to be a fun-looking robot monster. He's got an interesting transformation, and the chrome is the icing on the cake!